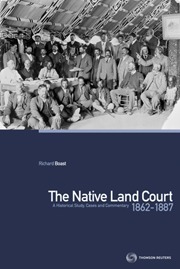 The Native Land Court 1862-1887: A Historical Study, Cases and Commentary is the first ever authoritative published selection of the Native Land Court's principal decisions. It contains a full introduction explaining the history of the Court and contains over 100 principal cases ... read full description below. The Native Land Court 1862-1887: A Historical Study, Cases and Commentary is the first ever authoritative published selection of the Native Land Court's principal decisions. It contains a full introduction explaining the history of the Court and contains over 100 principal cases each of which include full text and introductory commentary explaining the case and its significance. It includes cases from all over the country, ranging from the Houhora peninsula in the far North to Ruapuke Island in Fouveaux Strait, and includes such key decisions as the Oakura decision of the Compensation Court, the notorious Heretaunga block in Hawke's Bay, the Chatham Islands cases, and cases relating to the gift of the peaks of what is now Tongariro National Park. It will be of interest to iwi, legal practitioners, and historians and an indispensable reference tool for future work relating to the Native Land Court. The book has been written and edited by Professor Richard Boast of the Faculty of Law at Victoria University. The author teaches legal history, Maori land law and property law at Victoria University and has over 25 years' of experience as a practitioner and an expert witness in the Waitangi Tribunal and the Maori Land Court. He has published numerous books and articles on New Zealand legal history and the Native Land Court, including Buying the Land, Selling the Land, a study of Maori land alienation from 1865-1921 which was awarded the Montana Book Award category prize for history in 2009.